WASHINGTON (AP) — Kamala Harris, a first-term senator and former California attorney general known for her rigorous questioning of President Donald Trump’s nominees, entered the Democratic presidential race on Monday. Vowing to “bring our voices together,” Harris would be the first woman to hold the presidency and the second African-American if she succeeds. Harris launched her presidential as the nation observes what would have been the 90th birthday of the slain civil rights leader Martin Luther King Jr. The timing was a clear signal that the California senator— who has joked that she had a “stroller’s-eye view” of the civil rights movement because her parents wheeled her and her sister Maya to protests — sees herself as another leader in that fight. 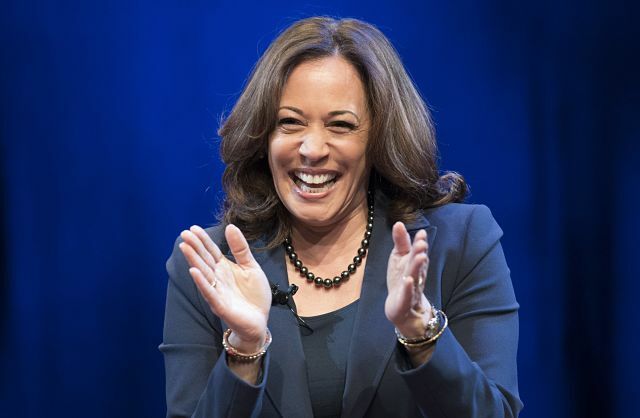 Harris joins what is expected to be a wide-open race for the Democratic presidential nomination. There’s no apparent front-runner at this early stage and Harris will face off against several Senate colleagues. South Carolina, where black voters make up a large share of the Democratic electorate, is likely to figure heavily into Harris’s prospects. And early voting in Harris’s home state of California will overlap with the traditional early nominating contests, which could give Harris a boost. Juan Rodriguez, who ran Harris’s 2016 Senate campaign, will manage her presidential bid. Her sister, Maya Harris, a former top adviser to Hillary Clinton, will be the campaign chair. The veteran campaign finance lawyer Marc Elias will serve as the Harris campaign’s general counsel, and Angelique Cannon, who worked for Clinton’s 2016 campaign, will serve as national finance director. David Huynh, who was Clinton’s director of delegate operations in 2016, will serve as a senior adviser. Lily Adams, a Clinton campaign alum who has worked as Harris’s spokeswoman, will be communications director. Her staff says she plans to reject the assistance of a super PAC, as well as corporate PAC money. She’s invested heavily in cultivating a digital, small-dollar donor network before her presidential bid. Harris is likely to face questions about her law enforcement record, particularly after the Black Lives Matter movement and activists across the country pushed for a criminal justice overhaul. Harris’s prosecutorial record has recently come under new scrutiny after a blistering opinion piece in The New York Times criticized her repeated claim that she was a “progressive prosecutor,” focused on changing a broken criminal justice system from within. Harris is framing her campaign through her courtroom experience. The theme of her nascent campaign is “Kamala Harris, for the people,” the same words she spoke as a prosecutor, trying a case in the courtroom.